You know that MoDOT takes its workers' safety seriously. Did you realize that just as much attention is given to the safety of motorists who travel in work zones? 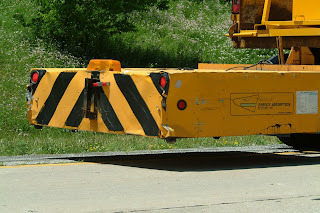 Why else would MoDOT buy a piece of equipment which is designed to be destroyed? 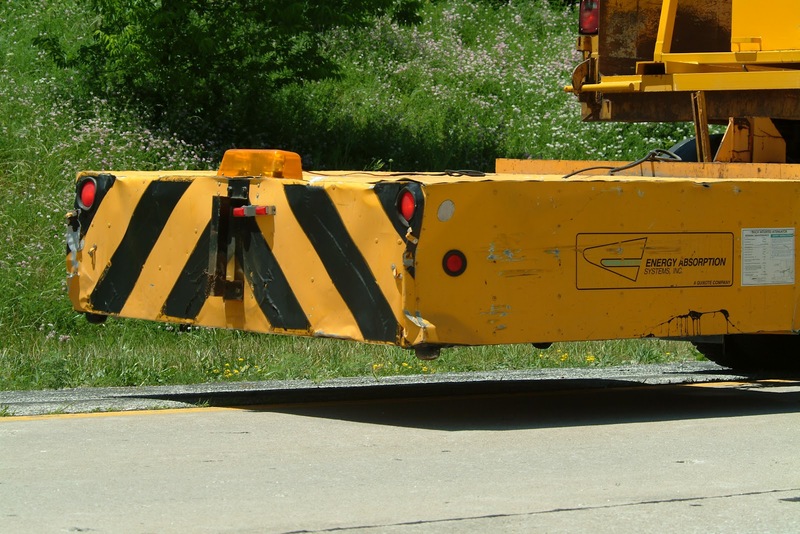 MoDOT uses truck-mounted attenuators because its vehicles tend to be struck from behind in work zones. Attenuators are like giant, crushable shock absorbers. Mounted to the end of the truck and transported and folded into active position in work zones, the equipment serves as a sacrificial item to protect lives and equipment. 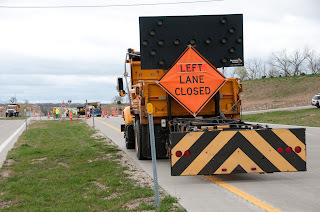 Say a driver is not paying attention or is forced out of his or her lane and is set to collide with a dump truck or other vehicle in a 55 mph work zone. Instead of crashing into metal vehicle, the driver hits an attenuator which crumples, absorbing momentum and reducing the force of the impact. Damage to the driver and vehicles involved is lessened. Sometimes, drivers walk away from these crashes. As they do so, MoDOT is able to call out for another attenuator and continue using the same dump truck. So while all drivers are urged to pay close attention and operate safely in work zones, know that attenuators are on the job to help keep you safe...just in case. Note: The day after this blog was posted, a commercial truck traveling on I-70 struck the TMA mounted on a MoDOT truck that was part of a crew painting stripes on the interstate. Both drivers escaped the crash with only minor injuries. If you know a high school student that enjoys math and science, the Youth Transportation Conference may be a great way to spend a week this summer. The free conference runs from July 15-20 in Jefferson city and includes all meals and supervised lodging. "With a little prodding from me, my son Tyler signed up for the Youth Transportation Conference last year. His guidance counselor had sent home a flyer with him because she thought it would be a good chance to channel his love of math and science toward a career goal. However, Tyler’s vision for the summer was a bit more laid back. I insisted the six days would fly by. Tyler surrendered and his application was approved a few weeks later. Not only did Tyler have a blast with all the hands-on activities, he made some friends he’s still chatting with online. His favorite activity was the model bridge building. His team’s popsicle stick creation even held the most weight. What’s more the visit to the MU civil engineering school has put it on his short list of colleges." Completed applications must be received by June 8. For more details, go to http://www.modot.mo.gov/EqualOpportunity/youthcamp.htm. If it runs on wheels, he’ll find a way to race it. His truck is bigger, badder and bolder than any pickup you’ll see on the highway. Little kids look at him in awe. Bobby Holman, owner of Team Beast and driver of the Lucas Oil Stabilizer monster truck thrills thousands in his appearances at races across the country. With 1,600 horses under the hood and 27 years of competition under his belt, the man knows what he’s doing. Holman would never dream of starting the engine of the Stabilizer – or his family SUV – without first buckling his seat belt. He says as much in the announcement he recorded for Missouri’s motorists. It’s the way the pros roll.